Folks who actually paid close to half a grand for the Sony Reader probably won't mind too much about having to buy eBooks to read on it. But it's not like they enjoy spending more money. 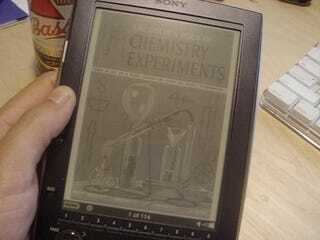 For those people, Make's got a guide to optimizing PDFs for Sony Reader's format. Using this, you can make word docs, presentations, and professional layout applicaiton docs into something that look good on Sony's Reader. The guide, however, comes in PDF format—presumably optimized for the Reader already so you can read the guide there while optimizing PDFs on your PC.